The 30-second TV ad will run in the Charleston and Bluefield media markets and is comprised mostly of excerpts from President Trump’s speech at a recent rally for Republican candidate Patrick Morrissey. Joe Manchin’s support for individual gun ownership rights has earned him an “A” rating and endorsement from the NRA-PVF. 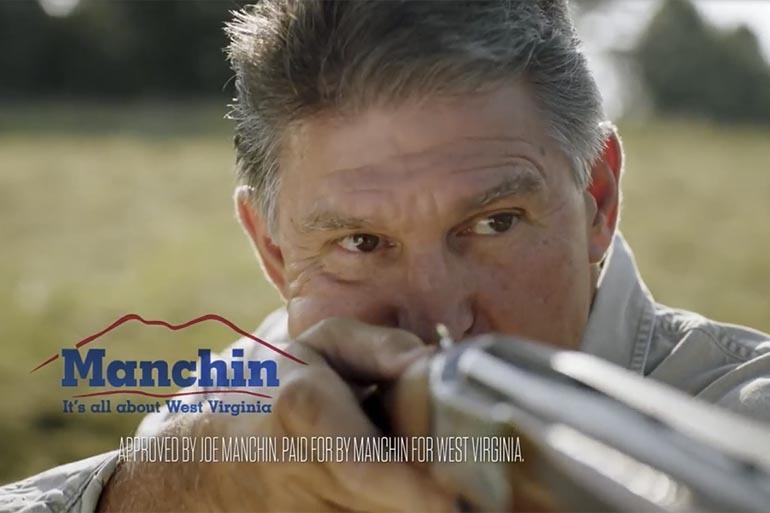 We ask all West Virginia gun owners, hunters and NRA members to vote Joe Manchin for U.S. Senate on November 2nd. Manchin is just one more example of a disturbing pattern of NRA-supported candidates betraying the organization. And they all don’t have a (D) after their names. It has happened on both the state and federal levels, Florida and Vermont being two of the most prominent as they’ve both passed gun control legislation recently under the signatures of GOP governors Phil Scott and Rick Scott. Both West Virginia’s Manchin and Tennessee Senate candidate Phil Bredesen are two once-favored candidates who now find the NRA actively backing and working for their opponents. Whether or not that makes an impression on future potential turncoats probably depends largely on the how these two fare in November. Like several others, Manchin participates in a charade, wherein he votes against gun control when his vote makes no difference. But when the chips are down, he is absolutely reliable as a grabber. How you can look yourself in the face while shaving every morning, I cannot understand, when you so absolutely knowingly deceive the voters who put you in office, over and over, lying like a rug. Because you “know what’s best for them”, even if they don’t. A hallmark of every politician with a D after their name — they are the enlightened few, who know so much better what the people actually should have, than the unwashed masses know. It didn’t always used to be this way, but it is now. The guy is nothing but a surfer. He rides whatever wave comes along. I hope the people of West Virginia send him back to hawking cheap furniture. Not going to happen. Manchin has never lost an election and came in second in only one primary. And let’s not forget that the geniuses in WVA elected that snakehead Jay Rockefeller to the Senate for 30 years. Living within view of the WV state line these many years, and getting most of our radio and television from one of their major markets, I can say a thing or two about WV politics. One is that they detest honesty, vastly preferring very large lies (and enormous pork to prop up their rotten, corrupted economy). Second, When deciding between candidates, West Virginians seem to attempt to discern which has the most appealing lie, and go with that candidate, regardless of likelihood or plausibility of fruition. Then again, they are currently impeaching the majority of their state supreme court…for theft and embezzlement, this under their first Republican state government ever, so perhaps they are learning. It has, remarkably, taken the death of king coal for West Virginians to realize that regardless of campaign promises, democrats are not their friends or union brothers. Then again, West Virginia consistently ranks in the bottom 2 or 3 in the nation in education and standardized test scores. At least up to the last couple of years, everything in WV is heavily corrupt and built on mountains of lies so bombastic that only by keeping the citizenry uneducated does any incumbent have a prayer of reelection. The sun began to shine there with Trump, and it has already cleansed the state house and now the court. May the purifying light also clear the national representation of the state. Heck, even the governor, elected as a Democrat, is now a Republican. I’m not sure if that’s an improvement or further evidence of just how gullible the average West Virginian is…only the next election will tell. That being said, nothing that occurs in WV politics can be extrapolated accurately to make predictions for the country at large, even if it seems so at the moment. WV is a bizarre circus of its own. On the other hand, they do have constitutional carry, so they can’t be all bad. Obama woke up those geniuses in WV and they elected a Republican State Senate and overwhelmingly voted for Donald Trump . Even geniuses can fall asleep for periods of time . Let’s not forget , passed right to work , eliminated permit requirements on all carry ( open and conceal OK ) , voted to repeal ACA , changing tax structures from 10 brackets to 3 , eliminating estate taxes , lowering corporate taxes from 35% to 20% , opening state forest to tree farming and natural resources recovery , flipped a democrat governor to republican , voted for Trump at a 40% clip and actually putting the fear into old Chucky Schumer Joe this time with Morrissey actually closing the gap . WV is noted now in history as the fastest state to ever flip the numbers , and it appears the bluest state is now the reddest state . I think old Joe will probably be re-elected , but I won’t be surprised if he isn’t . “What is ever so interesting is that Sen. Manchin got major support from the NRA in 2010 when he started his first campaign for Senate. Chris Cox gave the good senator a glowing review back then:…” What’s “so interesting” about any freshman Congressman/person/thing changing after they’ve been in the swamp for a few years??? It happens all the time- they like the primping and coddling, being invited to the big parties all the time and soon enough they start listening to their staffers and others who’ve been working in the swamp for years and go with the progressive agenda that even many of the most conservative lawmakers have on the payroll. All one has to do is spend some real time in DC and it doesn’t take long to forget that the majority of the nation’s voters do not live, act and think like those inside the beltway. NFBD. 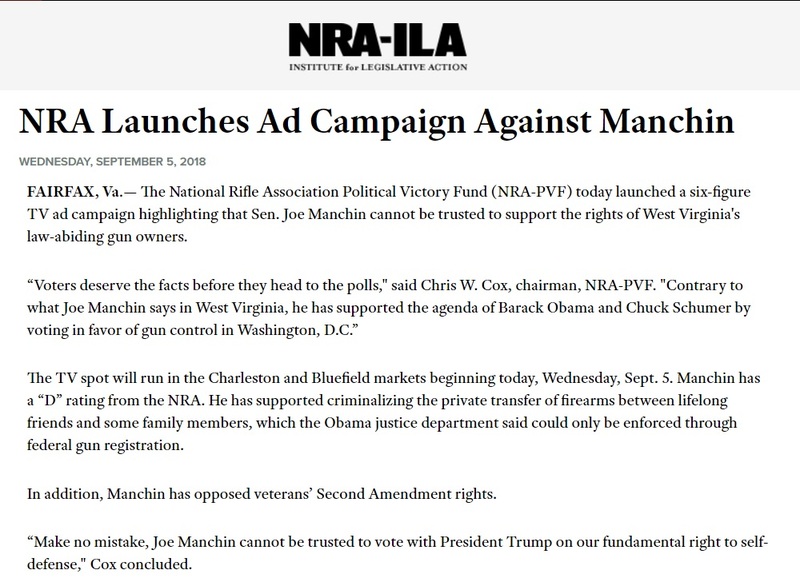 Let’s not forget that the Second Amendment Foundation also supported the proposed Manchin-Toomey bill. So I guess that Alan M. Gottlieb would also be D-rated. When Harry Reid / Chuck Schumer tells the “I support the 2A” Democrats that there will be no nice committee assignments until you vote my way, they eventually vote his way. Yeah, just like Schumer turned that tramp Kirsten Gillibrand from an A to an F in about twelve seconds. KG only pretended to be a country girl until she got the full support of Nassau and WC counties. If the guy had a brain he would have party fliped 6 years ago. Worked for Arlen Spector over in PA. Agreed 100%. He cannot hold his positions (however closely he holds them) and be a member of the democratic party. The democrats require 100% fealty to “the cause”. He should flip to Republican. Or, perhaps better for him, he should flip to being an Independent, who caucuses with the republicans. Staying a D is a death sentence for his political future. He started worrying about job security rather than adhering to his personal beliefs just like the rest of the lying Democrapic party. They follow a “Party Line” just like loyal communists did after WWII when Stalin ordered countries not to take Marshall Plan money. Therefore Eastern Europe was a pile of dung until the Soviet Union came apart. Stupid is the only word for both situations. Manchin learned what other pro-2A Dems that came to Washington before him did; you will toe the line and bow before Schumer. Joe really should have switched parties 2 years ago. It’s been done before. He’d be a shoo in for reelection. He should still try it now. It’ll piss off the democrat voters to no end, but … who else are they going to vote for? Either way the country wins. He would fit in perfectly with the RINO’s. He is in real trouble here in WV thanks to West Virginians support for Donald Trump and Trumps support for Morrisey . ‘ Old Chuck Schumer’s Joe has gotta go ‘. He’s been running adds where he shoots bills with shot guns and one where he’s sitting talking about his impartiality while holding a big scary BLACK GUN . What a politician , what a joke , what a swamp monster . Hopefully Rick Scott gets no NRA money for his senate campaign either. Too bad the idiot coal miners in the state don’t see the writing on the wall and realize that their industry will be dead in a decade. Hell, it is only limping along right now cause people like Trump and Manchin are feeding it with government subsidies, tax breaks, and tariffs against their competition. The people of WV know their industry is dead without Manchin which is why Manchin is going to win. He is willing to stifle the free market with our federal tax dollars as long as it gets him re-elected. Guy is a true Crony and the sad group of Neo-conservatives and Nationalists that currently run the Republican party are completely willing to elect an anti-gun Democrat as long as it means they can push their nationalism and market regulations further. 40 percent of US electricity comes from coal, and there are centuries worth of it still in the ground. It’s also key to making steel…something we might actually start doing in this country again, soon. Coal doesn’t need subsidies so long as it’s not under attack by the current presidential administration and congressional majority. If coal were dieing on its own in a few decades, why would Obama take repetitive shots at the industry, why would Hillary run on ending the coal industry? Coal is currently in no danger, and frankly we cant get rid of coal without someone spending massive amounts of money to build new power plants that run on…something else. WV has gone Republican from the governors mansion to the state house. I don’t think they are fooled anymore about which party is on their side when it comes to coal. Or, at least, now the West Virginians are taking Trumps word for who has their interests in mind, rather than the unions, and that’s a good thing. Coal is far from dead. Just because America is using it less doesn’t make it gone. It’s still a very viable export product… like to China where they still need to import coal, despite having so many mines, because of their sickeningly large population. Can anyone point out where, exactly, he supported criminalization of private transfers as the NRA claims? AFAIK, the Manchin-Toomey bill only applied to gun shows and publicly advertised sales, neither of which would seem to apply to sales to lifelong friends and family (or do much to reduce gun violence, but that’s a different issue). And, the bill appears to explicitly prohibit a federal registry. I asked this same question of Sen. Ayotte’s office after she made a similar statement in opposing the bill in 2013, and got no explanation. While it’s appropriate (and good) that the NRA are actively campaigning against him, maybe waiting until after his (possible) pro-Kavanaugh vote would have been prudent.